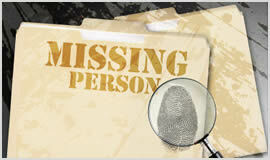 In the investigative industry today, missing person search is one of the most requested services. In the majority of cases, these requests come from individuals who are interested in locating the whereabouts of lost school friends, lost family members, skipped vehicle leases or skipped tenants. Edinburgh Private Detectives agency can provide you with the necessary assistance in finding cousins, uncles, aunts, children who were placed for adoption and brothers and sisters separated at birth. Any information that our private detectives might stumble upon during the course of the investigation is given to you without any restrictions. The speed and cost of our investigation depends on whether you can provide our detective agency with as much information as you can regarding the missing person we are looking for.